Last week a particular patent submitted by Apple outlined its plan to bring the mobile virtual assistant Siri to the desktop. It looks like Microsoft might be planning the same thing by bringing the Windows 8.1 voice assistant Cortana into Windows 9 proper. Cortana has actually been running within Threshold—Microsoft's codenamed OS build widely belived to be Windows 9—for some time, according to Neowin, but now the integration looks like it's moving forward. Neowin describes Cortana's "graduation" from a testing stage to a "let us push this forward and see if we can ship it" stage. It seems that Cortana would run as a separate but built-in app, and instead of taking up your whole screen like in Windows Phone (which on desktop would be unforgivably annoying) Cortana will pop up in a screen about one-fourth the size of your display. It'll also be displayed directly in the center, somewhat like Apple's improved Spotlight function in Yosemite. Of course lots can change between now and Threshold/Windows 9's eventual release. 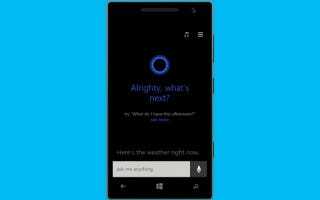 Microsoft could decide to drop Cortana from Windows 9, at least at first, or reversely more updates to the virtual assistant could allow for even deeper integration into the OS. Mary Jo Foley with ZDNet notes how Cortana integration in Windows (and eventually Xbox) would be in step with the company's new "One Windows" strategy, which includes plans for "universal" apps. It would also be a nice new addition to Windows whereas most leaks and rumors have just been about scaling back from Windows 8, including the return of the Start menu and the removal of the charm bar entirely.